This week Michael decided to sent me two songs to try and persuade me the 1980s weren’t a barren musical wasteland. Both songs are by The Piranhas, who, according to Michael, were a ska-punk band. I’ll take his word for it, because I don’t remember any band called The Piranhas. 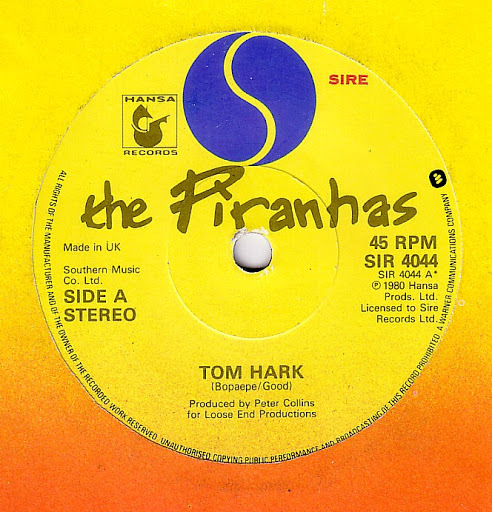 Of the two songs, “Tom Hark” is Michael’s favourite, so that’s the one he put forward for The Song To Be Dismantled Analyzed. OK. There were approximately eight things there I didn’t know. 0:00-0:03 – The swing beat at the very start of the song reminded me of the music of the 1940s. I like the music of the 1940s. Considering it’s a song that had new lyrics written for it, after the 35-second mark I started wondering where those lyrics had gotten to. 0:35-1:00 – The cuteness continues. Still no sign of those lyrics. 1:00-1:04 – The lyrics have arrived. Ugh. Talk about a mood-spoiler. The lyrics begin: “Does anybody know how long ’til World War Three?” Can I have a different set of lyrics please? 1:04-1:07 – But at least the lyrics are played for laughs. Next line: “I wanna know, I gotta book me holidee.” That’s better. 1:07-1:14 – Next two lines: “They want me in the army, but I just can’t go / I’m far too busy listening to the radio.” That’s fair enough. 1:27-1:39 – This a very jolly song. What ho! 1:39-1:52 – Next verse. More of the same “Knees up Mother Brown! Oi!” stuff. 1:52-2:05 – It’s gone a little quieter for this chorus. (The drummer stopped drumming.) I wasn’t going to comment on any aural aspects of this song, mainly because I hadn’t noticed anything out of the ordinary, but there is one thing about this chorus. Usually in a song of this nature (loud, cheerful, and singalong) there’d be handclaps on the offbeat. In this chorus, though, instead of handclaps there’s something that sounds like a suction cup, or a plunger – or something. I don’t know what it is, because I haven’t heard anything like it before. 2:05-2:18 – The drums have started up again, but suction cup thing is still there on the offbeat. Now I wondering if it was always there in the song. Time for a quick rewind… Ah, I’ve discovered it was there earlier in the song. It made its first appearance at 0:48. 2:18-2:42 – Here’s where the entire band does a little accent (first time at 2:20). It’s like a cancan dancer kicking out her leg. That’s about all I can think to say about “Tom Hark”. Not very interesting, but there it is. 0:00-2:44 – Great song, so-so performance. You are currently browsing the archives for the Lou Busch And His Orchestra category.